Modern Art Lanyards: Geometric, Abstract, Psychedelic, Trippy, Groovy, Pop Arts Lanyards. 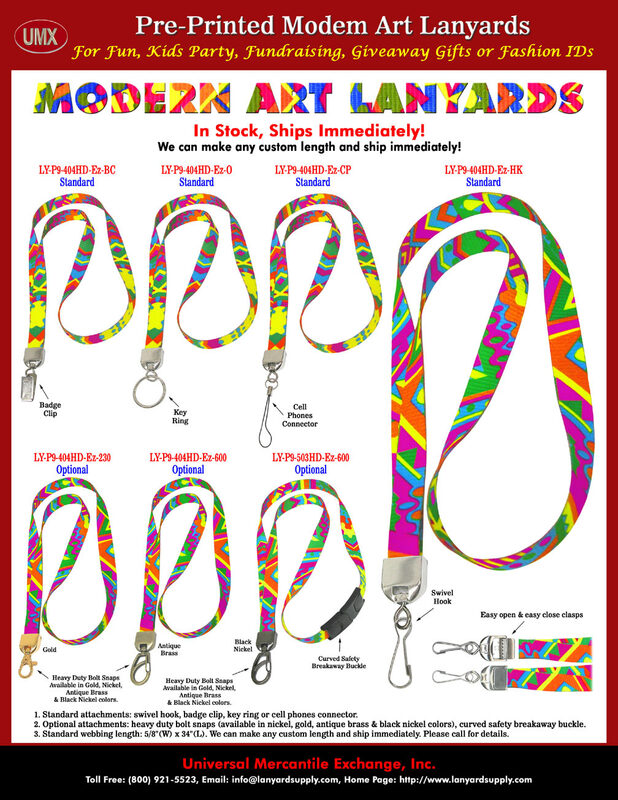 Modern art lanyards have pre-printed abstract, geometric and psychedelic designs. The designs look like the trippy and groovy pop arts of the 60s with bright and attractive colors. Standard hardware attachments for modern art lanyards are available in heavy duty nickel color swivel hooks, badge clips, key rings, or cell phone connectors, all at the same price. They can be worn as art neck lanyards or art wrist lanyards. Modern art lanyards also come with a variety of optional hardware attachments, such as safety break-away buckles, heavy duty nickel color, gold, antique brass or black nickel color snap hooks. All of the pre-printed abstract, geometric, psychedelic modern art lanyards are in stock, can be ordered at as small a quantity as 2 pieces and can be shipped right away. They are good for personal use, small business ID name bade holders, resellers, wholesalers, distributors, event fundraising or promotional giveaway gifts. Please check our online catalogs for more modern art, 60's trippy, groovy and pop arts printed lanyards supplies. Our modern art lanyards imitate the looks of the era of the 50s, 60s, and 70s retro, flower child, trippy, hippie groovy, psychedelic or abstract pop arts. We term them modern art lanyards: abstract lanyards with abstract arts, geometric lanyards with geometric drawings, psychedelic lanyards with psychedelic modern arts, the trippy lanyards with the 60's trippy artworks, pop art lanyards, the groovy lanyards with hippie groovy pictures - whatever you like to call it. You can find a variety of paintings and products that have the same style of artworks, such as fabrics, clothing, purses, handbags, jackets, T-shirts, cups, mugs, socks and more. Specifications: Modern Art Lanyards: Abstract, Geometric, Psychedelic, Trippy, Groovy, Pop Arts Lanyards. 1. Standard Width of Blue Plaid Lanyards: 5/8". 8. Pre-Printed Models: In Stock: Dye-Sublimated Multi-Color Blue Plaid Lanyards. Please check our online lanyard catalog for more information. 9. Custom Imprinting: On top of pre-printed modern art lanyards ( as back ground colors), any customized or personalized logo imprinting available - by way of silk screen imprint. 10. Applications: Used as modern art neck lanyards or modern art wrist lanyards. Good for personal use or for small business, resellers, wholesalers, distributors, kids party, out door adventure, fundraisers, event fundraising or promotional giveaway gifts. You are viewing > Lanyards > Ez-Adjustable Neck Wear Models > EZ-Adjust Lanyards: Variable Length Lanyards With Belt or Hat Straps Style of Lanyard Clasp Supplies.